Skybird HD contains every set of Player Armor (and tells you what you need to create them by Smithing) all Jewellery, Necklaces, Enemy and Faction Armor, Rings, NPC outfits, Soldier and Guard Armor, all Robes, Hoods and Clothes, as well as Special Dungeon Rewards, Quest Items and Dragon Priest Masks. 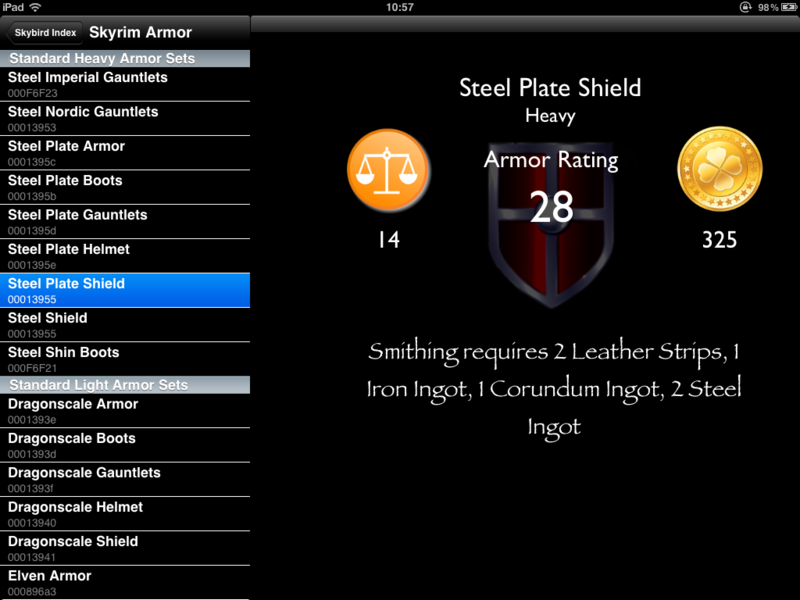 It allows you to choose through an easy-to-use, sectioned table menu and find the Armor you are looking for, and will then display the Weight, Value (base value), Armor Class (amount of base protection) as well as detailed and strategic notes on each piece. If the item can be created in-game through Smithing, the components and their quantities are also listed – you will know exactly what you need in order to manufacture the Armor at a Blacksmith’s Forge. 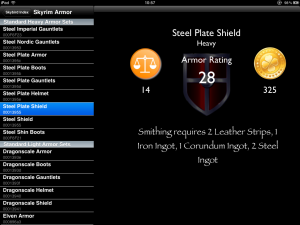 In addition, the table contains unique item codes, which the player can use to instantly create the Armor and add it to their inventory, using the in-game console. For those who don’t want to level their Smithing, or just want to try a piece of elusive Armor right away.